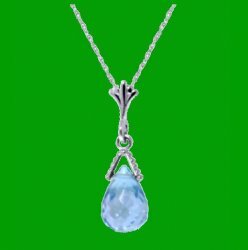 This lovely and beautiful Blue Topaz Briolette Small Drop Pendant is expertly crafted in 14K White Gold. A beautiful simple and elegant piece. Pretty, enjoy this Blue Topaz Briolette Pendant. Each pendant features One (1) Briolette Genuine Blue Topaz Gemstone measuring 6.00mm x 9.00mm. The pendant measuring 18.00mm (0.71 inches) x 6.60mm (0.26 inches). A 18.00 inch (45.75cm) 14K Gold Chain comes with this piece. The gold metal weight of this pendant is 1.30 grams. The stone weight of the Blue Topaz is 2.50 carats. This piece is also available in 14K Yellow and White Gold, please see my other listings in store for pricing and details. Please see drop-down menu for longer chain options available at an additional costs for the extra materials needed to make this piece - details are included. This beautiful Pendant is a perfect gift for any occasion. Elegant curves, luxury, smoothness. Wearing this beauty around your neck will provide you endless pleasure. The superior craftsmanship and timeless design of this pendant will compliment your evening wear exceptionally. This item is hand-polished by a qualified jeweller and displayed in an elegant gift-box. Please allow for sufficient time for your order to arrive.